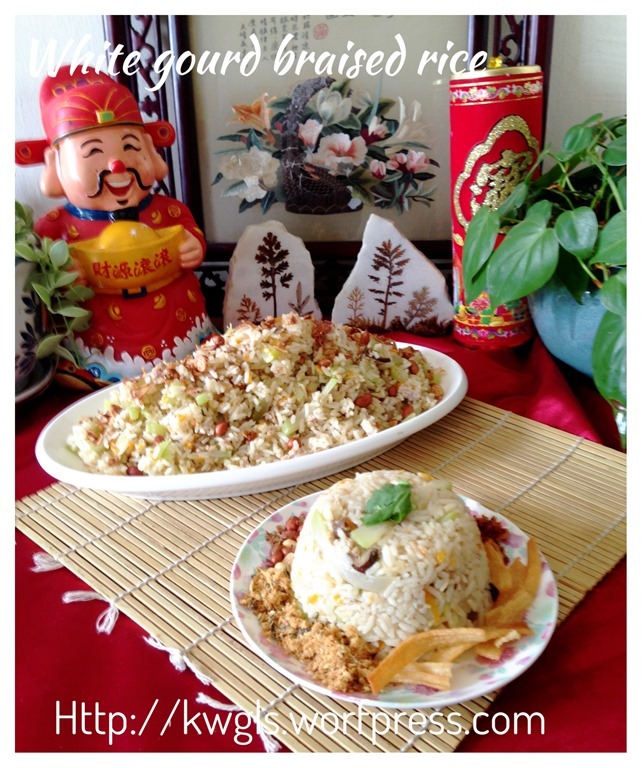 This is an old recipe relocated from the Guaishushu’s Facebook pages with new photo taking. 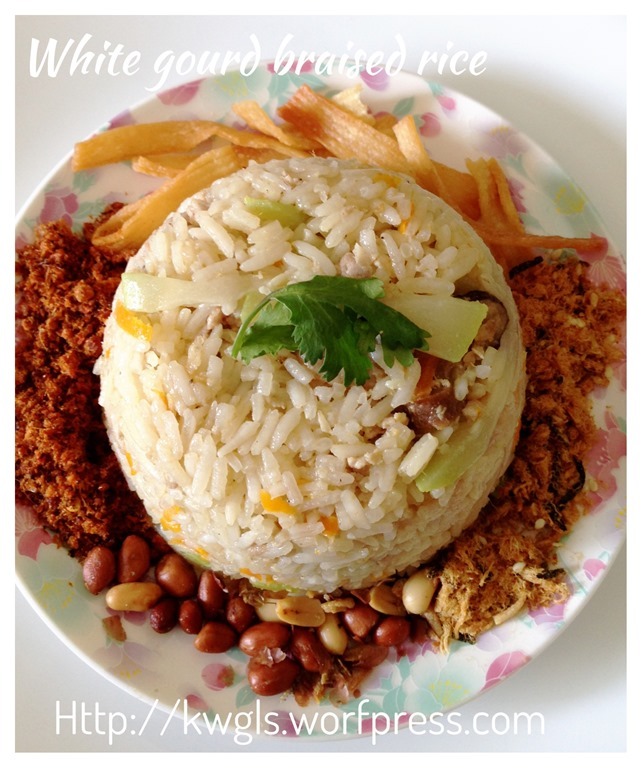 My late parents used to cook this type of rice. Unlike other dialect groups, Chawan (Zhaoan or 诏安）braised rice usually limited to two types of vegetable, white gourd （白莆） and bok Choy (大白菜）or napa cabbage。Green vegetables will not be used as these leafy vegetables cannot withstand long hours of cooking. In addition, the green colour will turn yellowish when cooked for long hours. 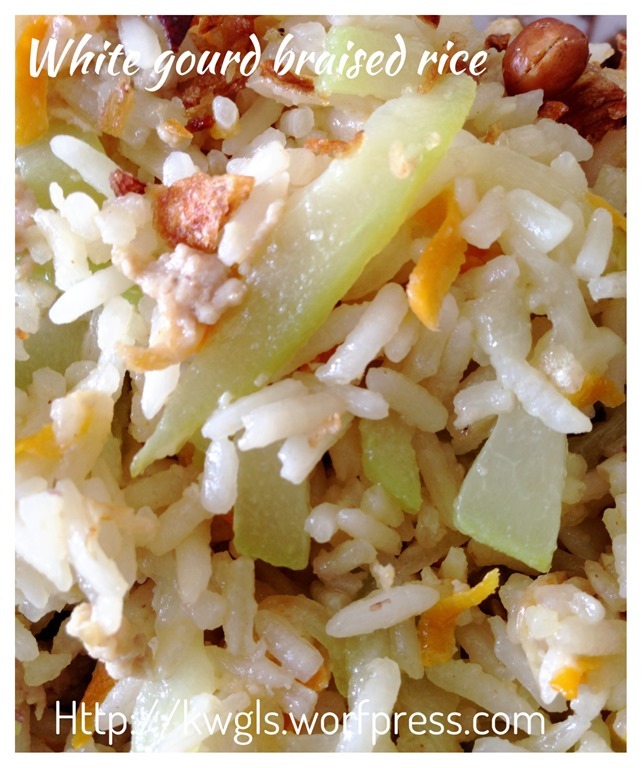 Therefore, only white vegetables were used traditionally. 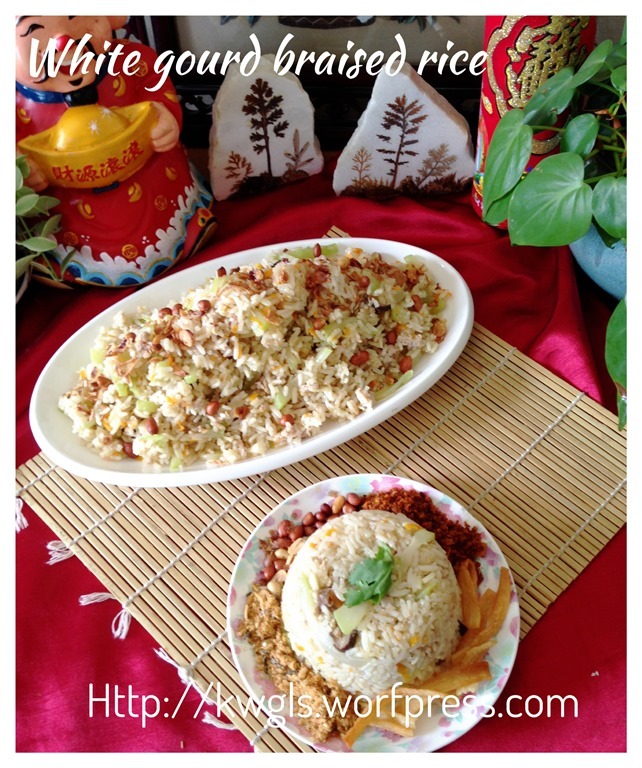 Having said that, other dialects do braised rice using long bean, cabbages or mustard green. Traditional cooking are using lard to sauté the shallots. However, for health purpose, I have used normal vegetable cooking oil. Of course, that will sacrifice the taste of the dish. But is it not health is more important? This dish shall be categorized as a one pot noodle and rice dish. De-skin the white gourd, julienne into thin stripes and set aside. When slicing the white gourd, if you knife can easily cut through the seeds, these seeds are edible. If it is hard to cut, it considered as too mature and you have to throw away all the parts that have seeds. 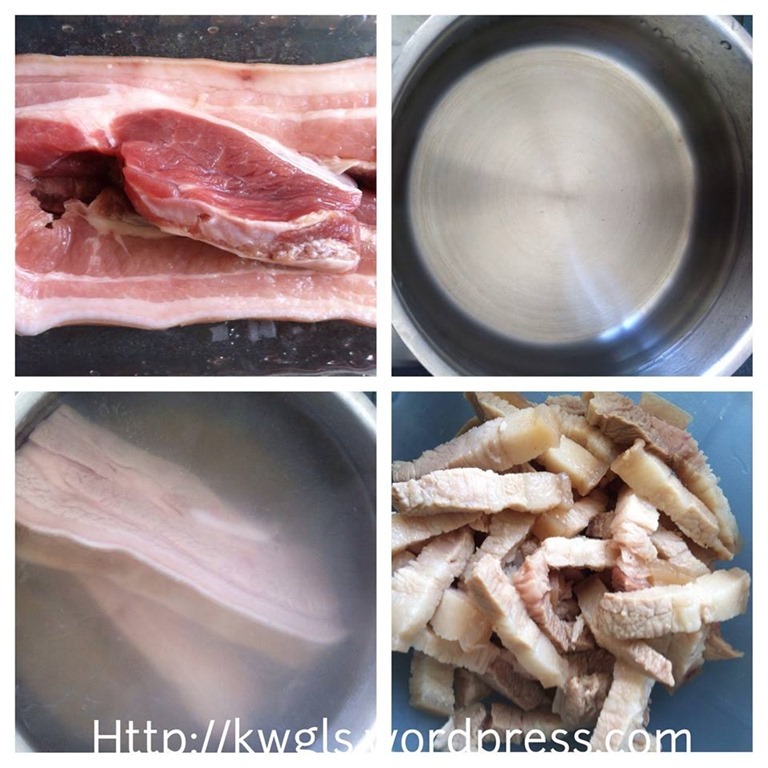 Blanch the pork belly in hot water for 15-20 minutes. Drain and cut into think stripes. Keep the meat broth. 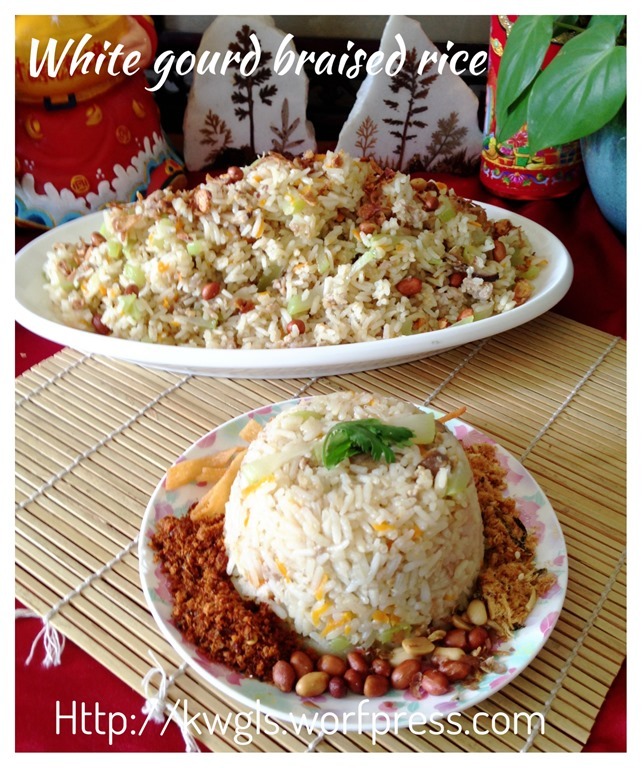 Alternatively, you can also use minced meat for this dish. 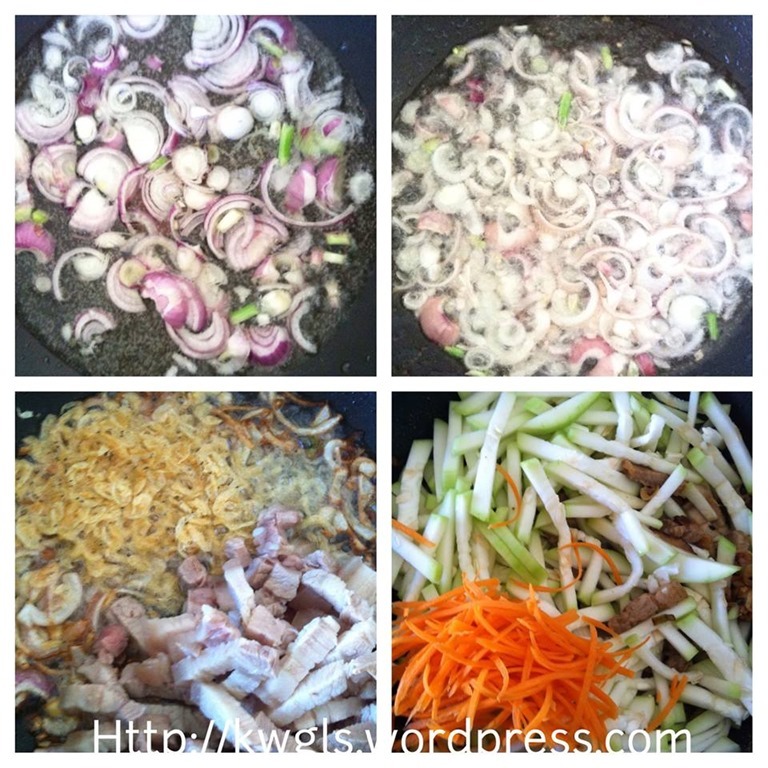 In a big frying pan, put some oil and fried the shallots until almost golden brown. 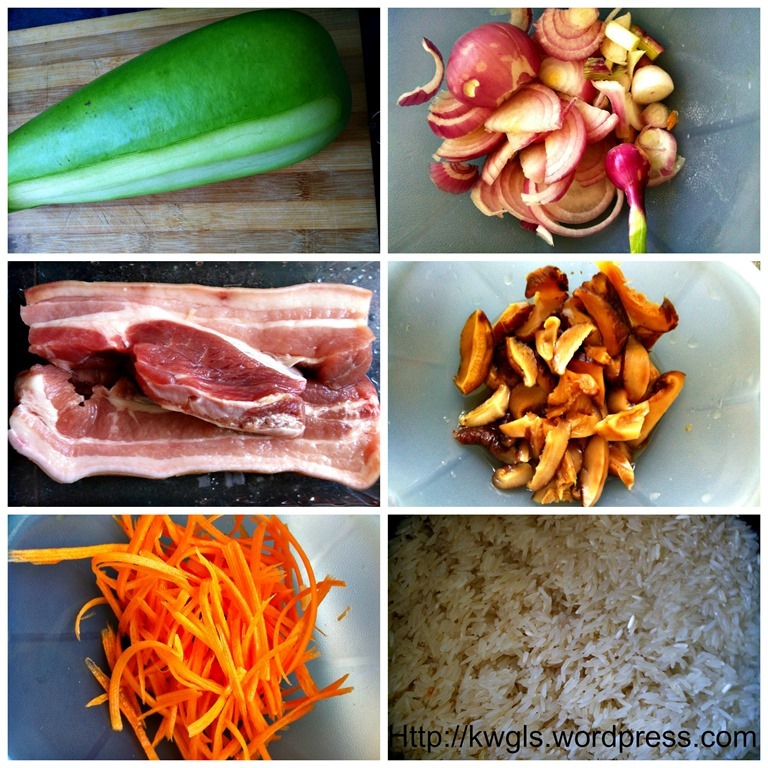 Add small shrimps, pepper, salt, mushrooms and sliced pork belly (or minced meat). Fried for a while until well mixed (about 2 minutes). Add in julienned white gourd and carrots and fried for another 2 minutes and until well mixed. 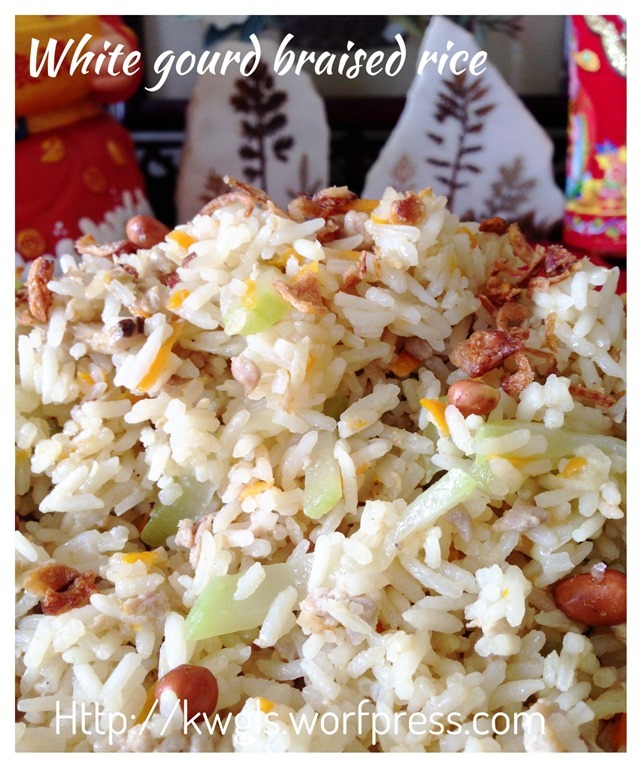 Use the rice cooker function for oiled rice (if any) or white rice. Occasional stirring is required to ensure all rice are evenly cooked. Add additional meat broth or re-cook for another cycle if your rice is uncooked. 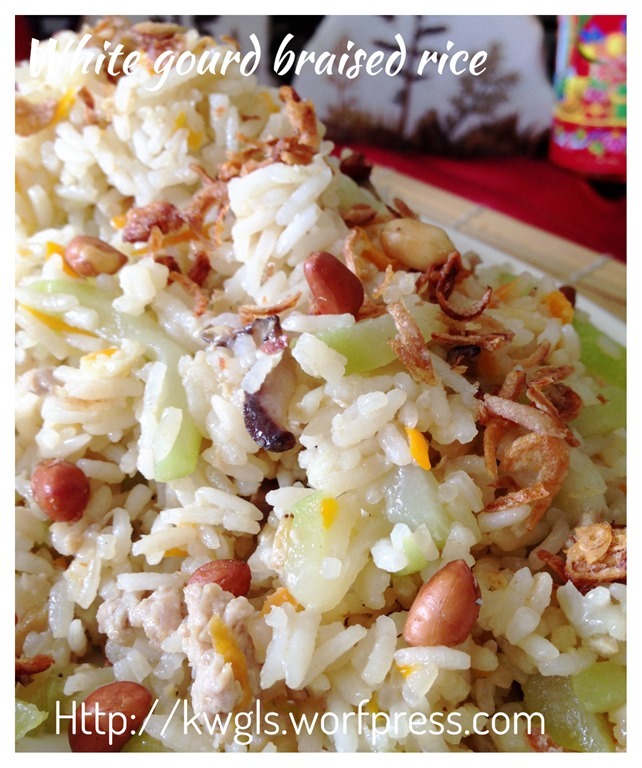 Keep the rice in the rice cooker for at least 15 minutes before serving. Best served hot with additional garnishes such as : Seaweed meat floss, spring onions, Chinese gallery, fried eggs . Generally, 1 cup of rice will require 1 cup of meat broth. As this is a vegetable rice, your water should be slightly reduced since cooked vegetable will emit some more vegetable juices. For example, if 4 cups of water is required to cook 4 cups of rice,than for vegetable rice, 3 cups of water should be adequate. 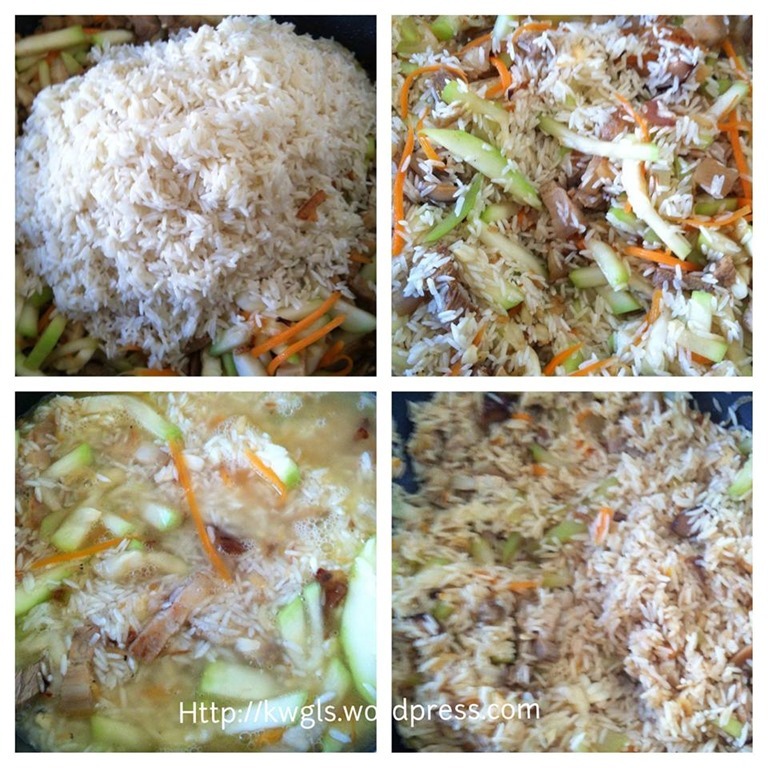 In the event you find that the rice is too dry or not cooked, just add some more meat broth. 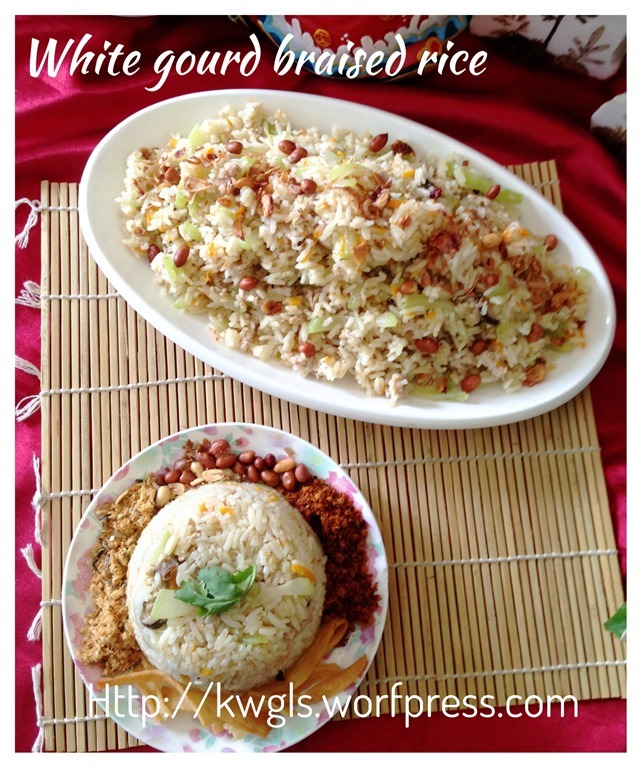 Another point to note is the vegetables and meat will add to the capacity of the rice. 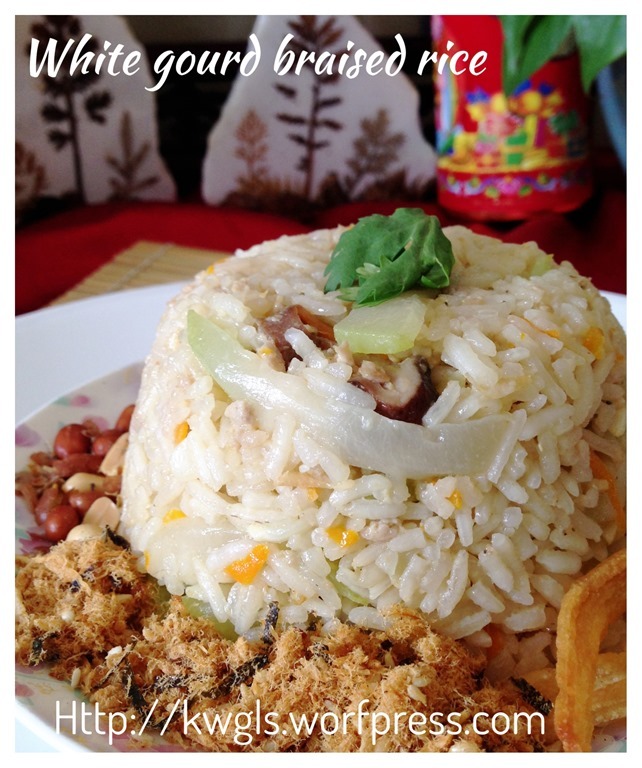 For example, if the capacity of your rice cooker is 5 cups, the more you can cook will be 3-3.5 cups of vegetable rice. 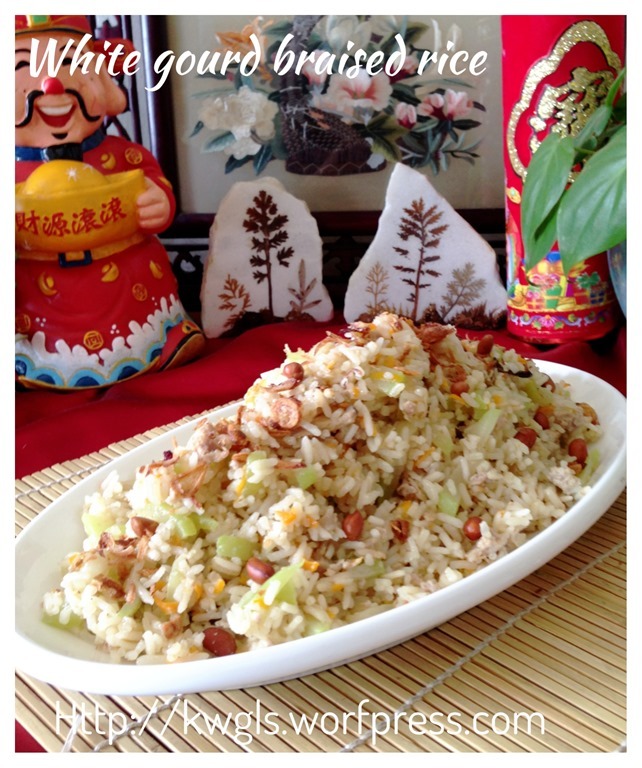 Remember that is a rather basic recipe for vegetable braised rice.. Alternative vegetables that you can consider are: long bean, cabbage, napa cabbage, mustard green. This is a flexible recipe, a bit more or less is acceptable and feel free to adjust the seasoning to suit your family’s taste buds. 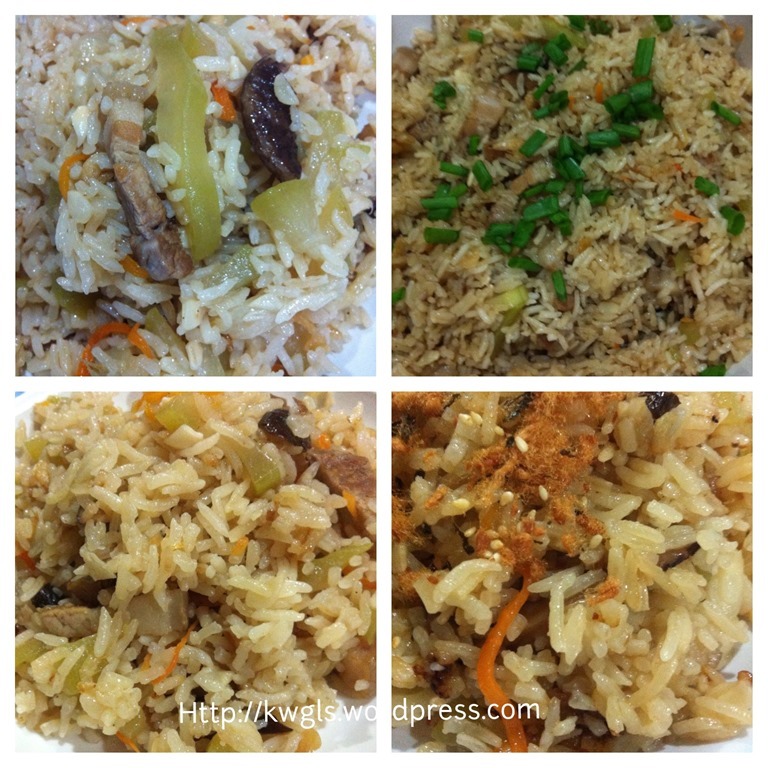 This entry was posted in Food Preparation Series, Noodles, Rice and Others and tagged 8, 白莆焖饭， 油饭，菜饭， white gourd braised rice, GUAI SHU SHU, Guaishushu, kenneth goh, postaday, vegetable braised rice. Bookmark the permalink.